*This post is sponsored by Arrow Fastener, a trusted company that has helped fuel our DIY passions for over 90 years. When I imagine the most perfect summer, I see wispy clouds streaking across a blue sky with a light breeze blowing. I’m swinging slowly in a porch swing while the kids play in the yard. 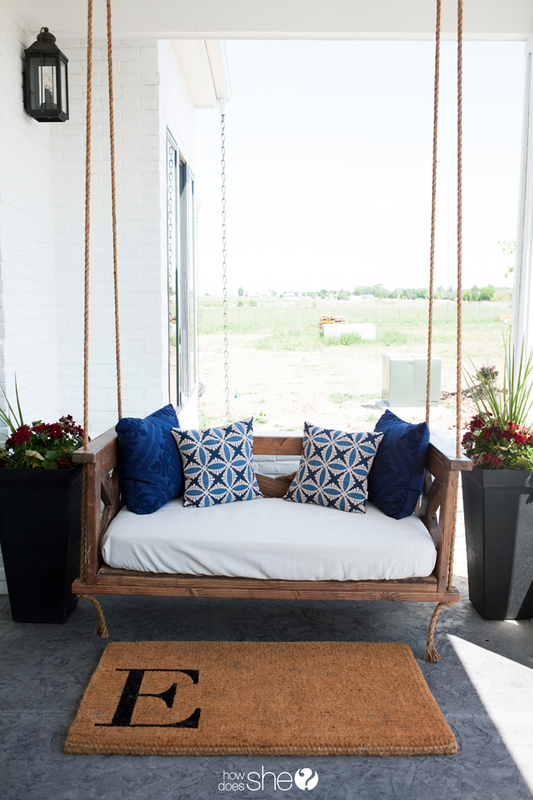 No matter how many versions of my dream I conjure up, there is always a porch swing. 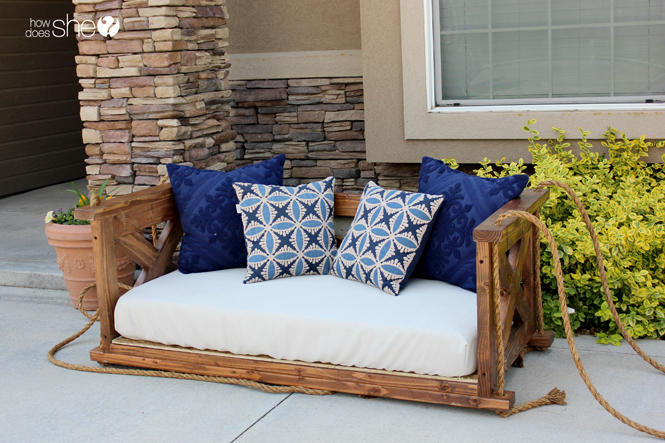 You can make your own fairly easy and this DIY farm-inspired porch swing is both gorgeous and functional. It’s sturdy and deep, and the secret is that it uses a crib mattress for the seat. How brilliant is that? My father-in-law has been making these beautiful porch swings that he sells to locals for some time now. We live in Idaho where farmland spans the landscape and stately red barns still dot country roads. If you love the modern farm style, then you’ll love this project! 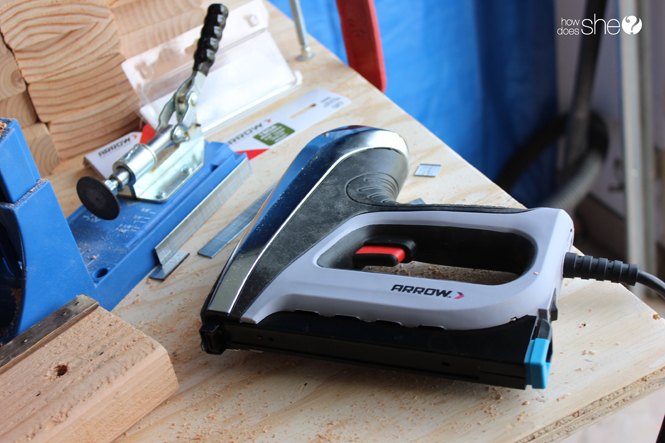 First, a big shout-out to Arrow Fastener tools that help us complete all of our DIY projects, large and small. From their iconic T50 staple gun (which I’m sure you’ve seen everywhere), to the Arrow T50AC electric nail and staple gun featured in this project, Arrow Fastener has been helping us “put things together” since 1929—that’s 90 years! Since the seat of this porch swing is a crib mattress, this tutorial and lumber dimensions are sized to fit a standard crib mattress approximately 5.5 inches (H) x 27.25 inches (W) x 51.63 inches (D). Step 2: Set them up in form. Before you begin fastening the pieces together, first set them up in form. Two side pieces, one back piece, and one bottom piece. It helps to label all cut pieces as “A,” “B,” and so forth in order to keep everything straight. Step 3: Screw all wood pieces together, starting with criss-cross sections. If you prefer not to see visible screws on your porch swing, use a pocket hole jig to make deeper, angled holes for your screws to go in. This is a simple step that makes a big difference stylistically. It just creates a clean, classy look. Fasten all wood pieces together according to this pattern (shown above), starting with the criss-cross pieces first. Step 4: Use a 1-inch drill bit to make holes for the rope. 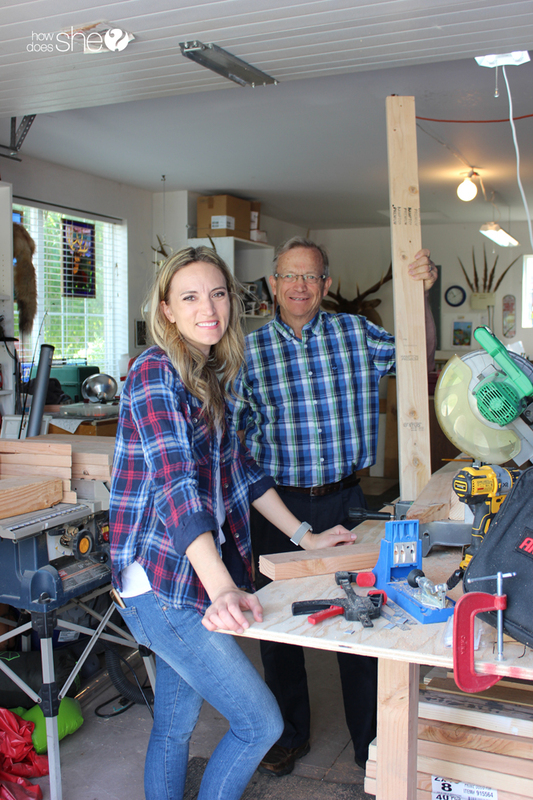 Since a rustic farmhouse look was what we were going for, we used a 1-inch drill bit to drill eight holes in the 2x4s where the rope will go to suspend the swing. Step 5: Use the Arrow Electric Nail Gun to fasten the bottom of the swing. 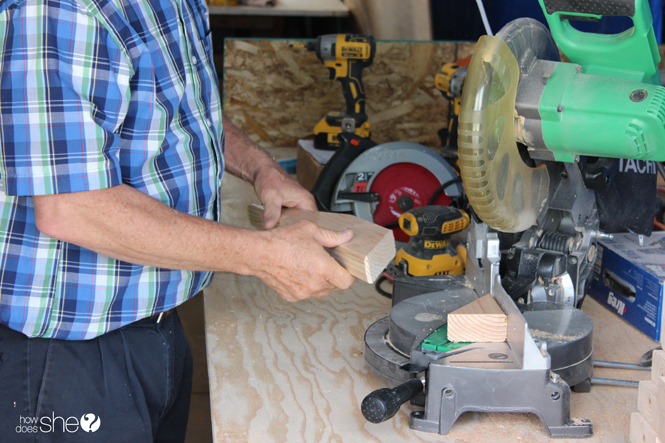 The bottom and final piece consists of four 2x2s and one 2×4 in the center for support. Fasten all 2x2s and the 2×4 into place. Next, take the half-inch piece of plywood measured to fit and use the handy Arrow T50 Professional Electric Nail Gun to fasten the plywood to the frame of the swing. This will be the bottom of the swing and serve as support for the crib mattress seat. 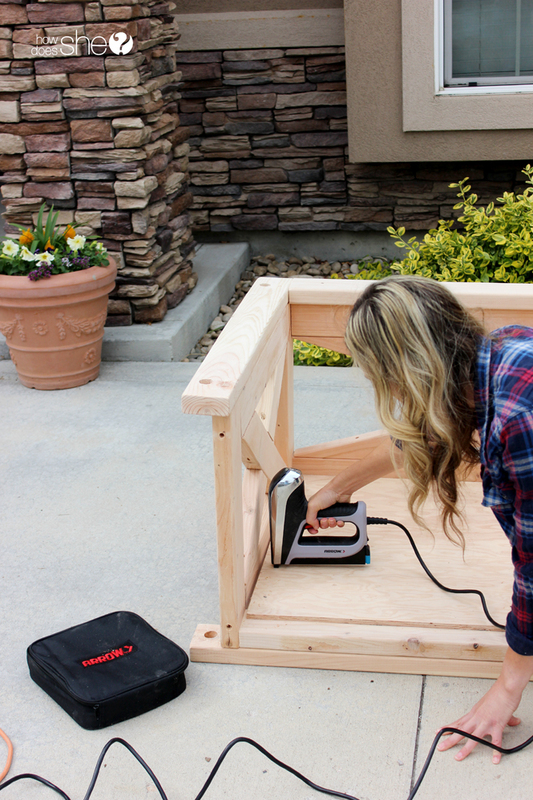 The Arrow electric nail gun is so easy to use. It’s such a handy tool to have in your arsenal. To see all Arrow Fastener tools and to get quick video tutorials, check out www.arrowfastener.com. Step 6: Stain and finish with a polyurethane finish. Finally, stain your farm porch swing and finish it with a coat or two of polyurethane finish to help protect it from the elements. Step 7: Use a crib mattress for the seat. The genius behind this particular porch swing is that it uses a crib mattress for the seat. It creates a deep swing that everyone can fit in and it is perfectly comfortable seating. I bought this new crib mattress for $50, brining the grand total for this entire porch swing project just under $200! 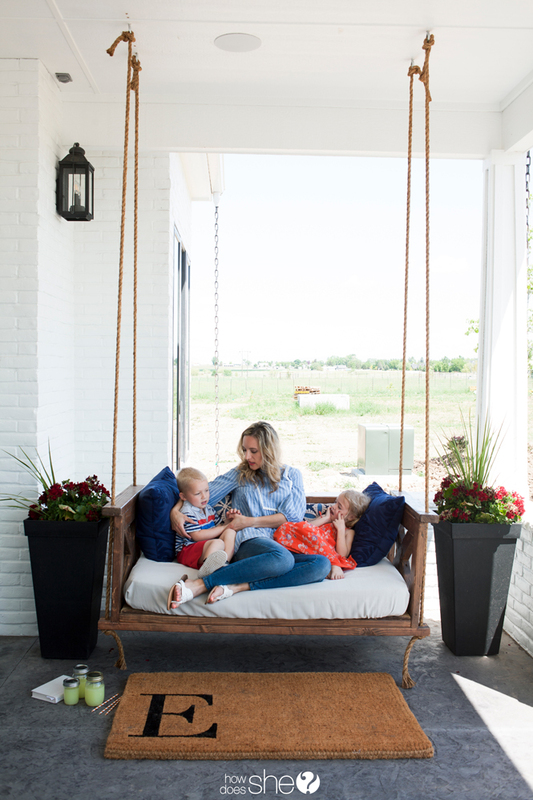 If you have some of these supplies on hand and an unused crib mattress, this porch swing can be very inexpensive to build. 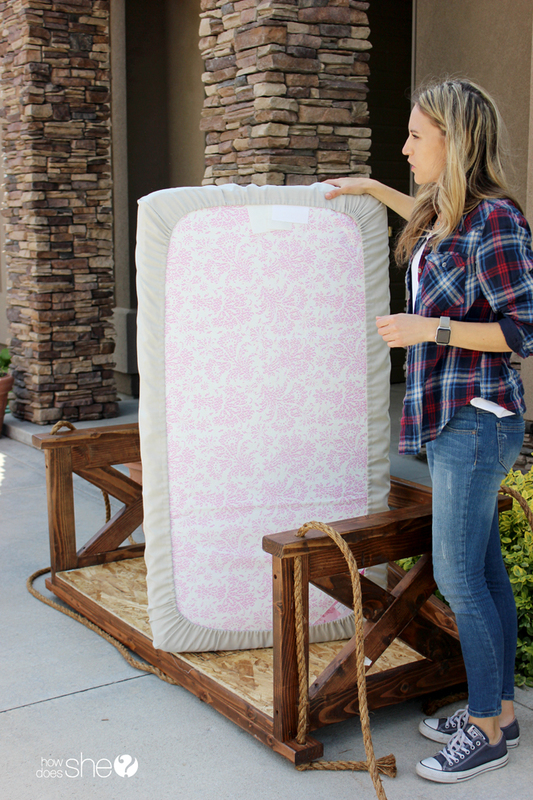 Cover the crib mattress with a sturdy crib sheet, add some pillows, and it’s ready to hang! Make sure to get heavy-duty eye bolt screws for hanging the porch swing. We also recommend attaching it to a beam if available, something sturdy. 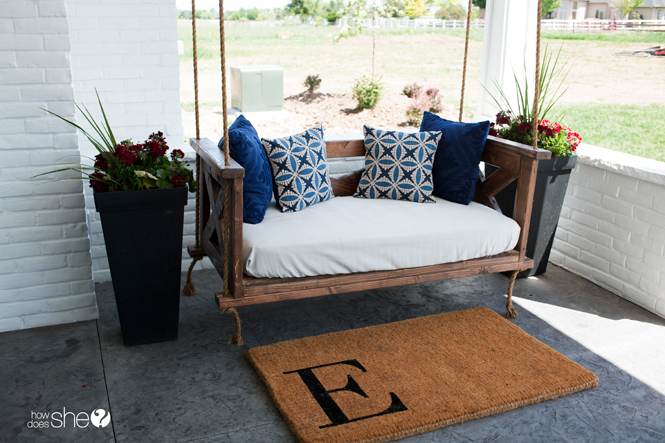 After checking that your new porch swing is securely fastened, grab some lemonade, find a breeze, and enjoy. *Thank you so much to Arrow Fastener for sponsoring this post. All opinions are my own. Thanks for stopping by! 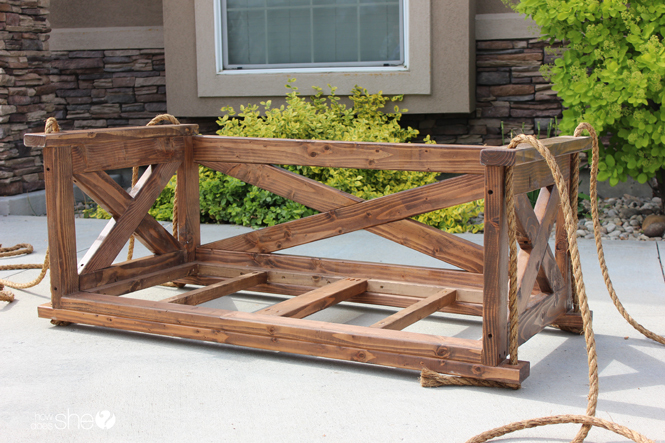 The post Beautiful DIY Farm-Inspired Porch Swing appeared first on How Does She.